16 April, 2018 (RT)* — US President Donald Trump wants to bring troops back from Syria as soon as possible, the White House said, but not before their goals are fulfilled. Earlier, the French president said he had convinced Trump the troops had to stay. “The US mission has not changed – the president has been clear that he wants US forces to come home as quickly as possible,” White House spokeswoman Sarah Huckabee Sanders said in a statement cited by Reuters. 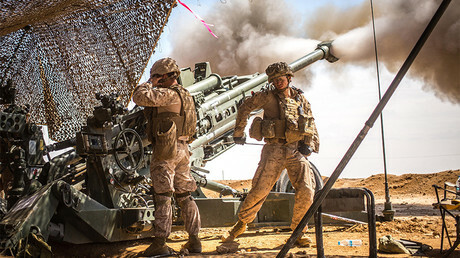 The US has some 2,000 troops and a number of military contractors acting in Syria. Before they go home, though, their mission has to be fulfilled. The goals outlined by Sanders were earlier mentioned by the US envoy to the UN, Nikki Haley, in a Fox News interview. Haley’s list was somewhat broader, though, adding monitoring Iran’s activity and ensuring American interests are safe from Syrian President Bashar Assad’s purported chemical weapons. The somewhat vague objectives, combined with Washington’s refusal to hold any direct talks with Damascus and numerous demands for Assad to step down or be toppled, could effectively extend “as quickly as possible” to a nearly indefinite stretch. Russian forces, who are on the ground to assist Damascus in fighting terrorists and de-escalating the conflict, said they had not found any evidence or victims of the alleged attack, and accused the White Helmets of faking it. Presently, Trump boasted that “nice and ‘smart'” American missiles would soon fly to Syria. 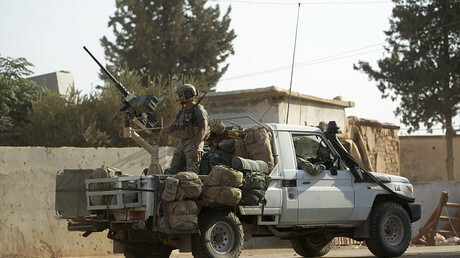 After a week of UN Security Council meetings and failed resolutions, and before a fact-finding mission by the Organization for the Prohibition of Chemical Weapons (OPCW) could arrive at the site of the alleged attack, Trump, together with Macron and UK Prime Minister Theresa May, launched about a hundred missiles into Syria. Their stated goal was to cripple Assad’s purported chemical weapons facilities and stockpiles, but one of the targets they hit was reportedly a civilian facility that specialized in medicine. Now, Haley says at the UN Security Council that America remains “locked and loaded” for more strikes should new “chemical attacks” come, and uses an if-clause when talking to Fox about the prospects of withdrawal from Syria. And while Trump’s people say he wants a withdrawal “as quickly as possible,” it’s highly likely that it will not be very quick at all.